I don't want to talk politics on this blog. I really don't want to bring Donald Trump or Brexit or ISIS or anything else into my happy little travel bubble. But here's the thing: it's virtually impossible to separate travel from politics. And it's virtually impossible to turn a blind eye (and ear) to the type of hate that is slowly starting to spread in my country and beyond. When Trump signed his executive order banning immigrants, refugees, and even visa holders from 7 Muslim-majority countries at the end of January, I couldn't believe it. I didn't want to believe that my country was giving in to religious and cultural prejudices like this. But I know that fear and lack of knowledge can be powerful. I think these feelings are misguided, though. If I've learned one thing through all my travels, it's that people all around the world are far more similar than they are different, regardless of race or religion or culture. So today I want to show you the beauty of the Islamic world, as seen through the photos of my fellow travel bloggers. I want to show you the people and landscapes and architecture that make these places unique and beautiful, and to show you that “Muslim countries” are not as scary as some world leaders sometimes make them out to be. The beauty of Indonesia is found in the diverse people, the untouched nature, and the epic vistas. From towering mountains to vibrant cities, from sandy surf beaches to small water villages, Indonesia has something for everyone. It is made up of over 17,000 islands (6,000 of them inhabited), and it's easy to stray off the regular tourist trail. It is a country you could spend a lifetime exploring and one of my favorites in Southeast Asia. I visited Istanbul as a solo female traveler back in 2012. Family and friends didn't want me to go to this “scary” country on my own, but I was determined to see its grand architecture and history with my own eyes. And I'm so glad I did. Istanbul has been at the crossroads of cultures for thousands of years, and visiting the Hagia Sophia literally brought me to tears. 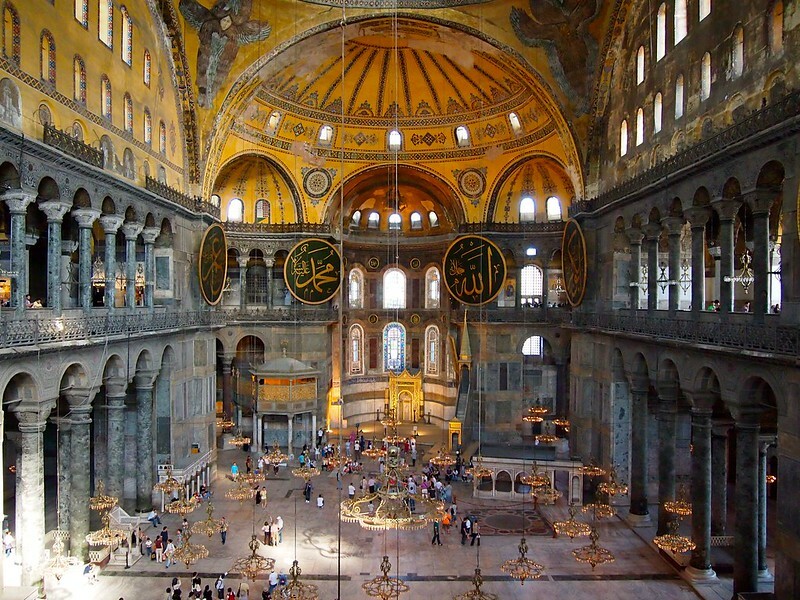 Built originally back in the year 360 as a Byzantine cathedral, this beautiful structure has seen the rise and fall of two empires, as well as the birth of a modern nation. It's been a church, a mosque, and now is a museum. And if that doesn't reflect the complexity of Turkey as a nation, I'm not sure what does. My trip to Iran – just like my previous trips to troubled lands like North Korea and Palestine – further reaffirmed that what we see in the media isn’t always the real truth. As I discovered, Iran is a country extremely rich in Islamic culture and old Persian history. It’s a land of poets, artists, and traders who carry on centuries-old traditions. Thousand-year-old ancient sites sprawl across the deserts, surrounding outstanding Persian architecture and fabled towns. Modern Iran is a sharp contrast, with chaotic traffic flooding up the bustling metropolis and busy urban dwellers rushing from one place to another in fashionable apparel. I did something I shouldn't have done in Jordan. I broke the rules. Exploring the ancient city of Petra, I made friends with the local Bedouins. They're a tribe of Arab nomads who have been wandering the desert for hundreds, maybe thousands of years. As you can probably imagine, they're no stranger to the life of a traveler. They're no stranger to the freedom it can bring. And so one of them — let's call him Mohammed — decided to share with me something special: a piece of their world that has now been closed off and restricted. Should I have climbed to the top of that monument? It depends on whether you ask the UNESCO Heritage board or the local people. But because of the Bedouin hospitality, I got to experience a vista that few other travelers get to see. I hate that the Middle East has been stereotyped in the media as being this scary and violent place. I have travelled extensively in the region and have been overwhelmed by the hospitality and respect accorded to me by locals, even as a woman who often travels by herself. This picture is from my recent solo trip to Oman, where I visited the grandiose Sultan Qaboos Mosque in Muscat, the capital. The beauty of Oman's sights is only rivalled by the warmth of its people. There is nothing to fear here. Travel to Kyrgyzstan because you might just find yourself in the jailoo (high summer pastures), staying in a yurt with a local family, and playing with a little boy and his pet dog while breakfast is being made over the fire. This is one of my happiest memories and a wonderful reminder that you don't need a shared language, faith, or age in order to connect with people. Sometimes all it takes is a smile and friendly pup to bring you together. Kyrgyzstan is a stunning mountainous country in Central Asia. One of the highlights of my visit was connecting with locals at the World Nomad Games – especially Zura. She warmly invited me into her yurt, where I learned through a translator she was an important figure in her village in the eastern province of Naryn. She holds degrees in law, medicine, and teaching, putting to rest the notion that just because she wore traditional dress that she led a traditional life. We spent almost an hour together, sitting in her yurt, her patiently answering my questions as we sipped our tea. I soon learned her reason for wearing traditional dress which I won’t soon forget: Young women can wear whatever they want to look beautiful. Older women can’t. They have wrinkles and extra fat. They need to wear traditional clothing to help them look beautiful. At 64 both her inside and outside beauty shine. Egypt is one of those destinations that wows everyone with its history, culture, and unbelievable iconic monuments. Our visit to Egypt was wonderful, although it was a very sad to see how few tourists are currently visiting this beautiful country. For us that meant uncrowded attractions such as the incredible pyramids, but it is making life tough for the people who depend on tourism to survive. We had an amazing experience though, and would definitely recommend it to anyone who has always dreamed of seeing the pyramids or sailing along the Nile River. Ethiopia is a very religious country, a practice highly visible in the lifestyle, food, fashion, and culture of the people. One thing I noticed during my trip there is how proud Ethiopians are of their religious coexistence. Ethiopian Orthodox Christians, Muslims, Protestants, and other faiths have managed to practice freely and respect each other, which is one of the reasons why Ethiopia is so culturally rich and diverse. It is a place worth visiting. Despite many warnings from both the US government and from friends and family, I visited Pakistan in October 2016 to see the so-called terrorist hot spot. What I discovered was a nation of unparalleled beauty and immense human kindness. While the northern areas are gorgeous and relatively untouched, Lahore's Walled City is so full of history, striking Islamic architecture, and organized chaos that it stood out as one of the major highlights of my travels there. The noise and heat are overwhelming almost all day long, but ducking into the mosques and forts offers beautiful reprieve. In the little over two weeks I spent there, I met numerous people who I now count among my friends, curious strangers who were excited to see a foreigner there, and many others who just wanted to snap photos with me. Since I've been home, I get messages almost daily from Pakistanis, thanking me for visiting and dispelling the myth that Pakistan is a dangerous Muslim country that should not be included in people's travel plans. I felt the complete opposite about it and cannot wait to return for further exploration. When I decided to travel to the Maldives on a budget, I wasn’t sure whether it would be either possible or enjoyable. Independent travel is very new to the Maldives — the government has only allowed access to the local islands for a little over five years — so it’s one of the rare places in the world where the locals have met only a handful of Western tourists. It’s also a strict Islamic country. To my surprise, I discovered the Maldives was one of the few countries where I felt extremely safe traveling alone as a woman. While walking around the islands with my boyfriend, we would attract nothing but curious stares, but the moment I left my guesthouse alone, the local women would suddenly smile and approach me to say hello. My favorite encounter was when a group of women motioned me over to where they were sat and generously pressed some Maldivian chocolate into my hand as a gift. This coconut, cinnamon, sugar, and jasmine blend was delicious and after telling them so, they handed me even more and continued to offer me some whenever I passed them on the island. This is one of the madrassahs that make up the Registan in Samarkand – a major stop along the Silk Road. Uzbekistan is amazing for its history and has some of the best preserved mosques and madrassahs from that time. The people are also incredibly welcoming and friendly. I traveled to the United Arab Emirates when I was five months pregnant, and had a wonderful experience. As an architecture lover, I couldn't get enough of the creative curves of the buildings. Everyone I met was incredibly friendly, and as a teacher, spending the day in a local school was a special treat. This photo was taken in the Sheikh Zayed Mosque in Abu Dhabi. We loved exploring Morocco when we visited in 2015 – we found the people to be friendly and happy to see us. A real highlight was the time we spent out in the desert with the Berber tribes people, camping out under the stars, singing songs around the campfire, and enjoying desert hospitality (and endless mint tea!). A truly beautiful country, well worth visiting. Tajikistan wasn't actually on my itinerary when I set off backpacking through Central Asia. But as soon as my friends and I arrived in Kyrgyzstan and started talking to other travelers, we knew we had to see Tajikistan for ourselves. It's crazy to think that I almost skipped it, because Tajikistan quickly became one of my favorite places, like ever. The people were warm and welcoming – we hitchhiked and stayed with local families our entire time there. And those views! From the Pamir Highway to the Wakhan Valley bordering Afghanistan, Tajikistan has some of the most beautiful landscape I've seen. This photo is from Murghab, the highest town in Tajikistan (and the former Soviet Union) at nearly 12,000 feet! When traveling in Israel, I knew I would absolutely visit the West Bank in the neighboring Palestinian Territories. Not only is it safe, accessible (aside from the routine checkpoint control) and full of areas of rich historical significance, it is essential to understanding the on-going conflict from both viewpoints. It’s in the West that you will get to visit the (actually little) town of Bethlehem, site of the Nativity; the archaeological Jericho that dates back to 10,000 BC; the capital, Ramallah, which is a thriving city; and the contested Hebron, still divided into two zones of Israeli and Palestinian control. Locals here welcome you and are happy to show you around, but it’s important you also listen to their narrative. As I say in my post on traveling to Hebron, “the actions of extremists on both sides are in no way reflective of the people in both countries who go about their day-to-day lives while all this is going on.” Travel soon makes you see that what the media reports is not so black and white. Visiting Sudan was a highlight of our cycling trip through Africa. The people of Sudan are known as the friendliest on the continent, and they lived up to expectations. While traveling through the Nubian Desert, people stopped to welcome us to their country. They offered us tea and water and everyone gave us a wave and smile. We will always remember the warm hearts of the people of Sudan and will forever be grateful for the hospitality they showed us each and every day. Now, am I advocating that you go and book vacations to all of these places tomorrow? Not exactly. But I am asking you to stop and think before you try to paint an entire region, religion, and people with the same brush. 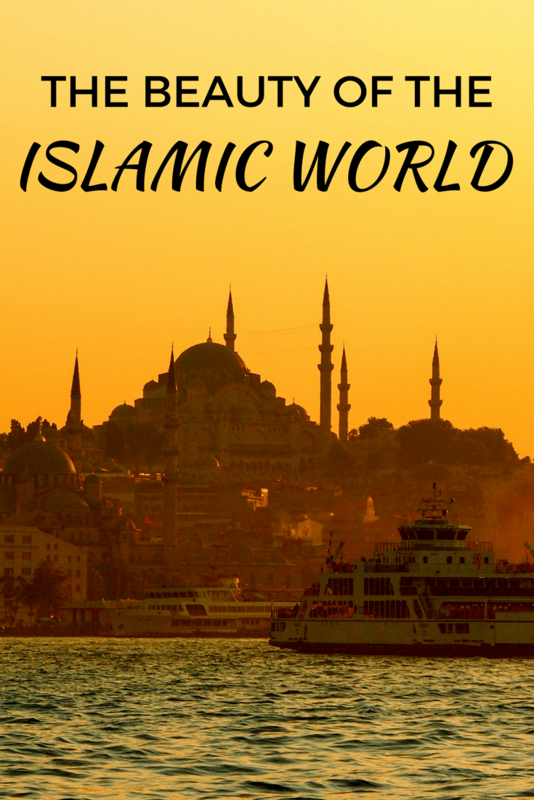 The “Islamic World” is vast and diverse, just like the rest of the world. And it's beautiful in its complexities, as long as we make the effort to open our eyes. What kind of stories do YOU have from traveling in these parts of the world? Beautiful and thoughtful post Amanda, thanks for including us! So many places I haven’t visited (but want to) on this list! Thanks for contributing! 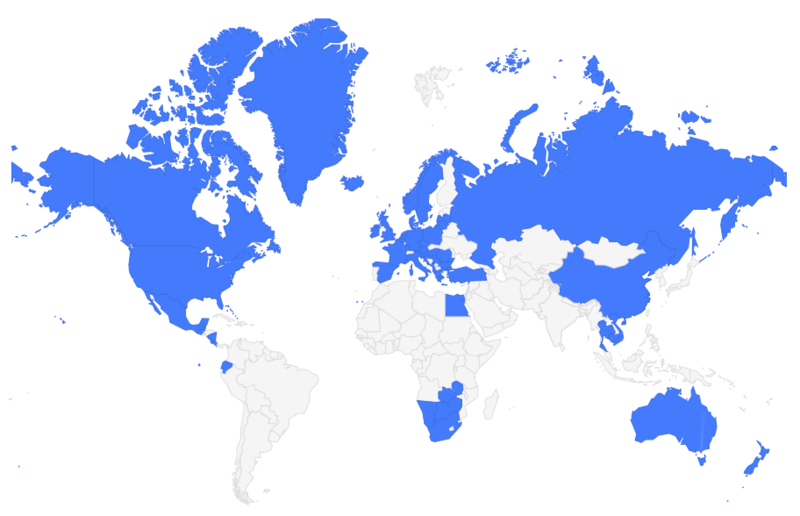 And I’m with you – I’ve been to hardly any of the countries featured here, but would love to visit them all! It’s the biggest lesson I’ve learned from traveling, and is a huge reason why I think travel is so important! What a great post. It’s sad how the media so often portrays Muslim countries and people as something to be afraid of. There’s good and bad in every country and ordinary people don’t necessarily reflect the views of their leaders. I’ve been to some of the above countries and have never had any problems. Great post! I’ve only traveled in two Muslim countries and one of them, Turkey, still stands out as one of my favorite places to visit in the world. I’ve seen so little of this part of the world, but would love to visit them all! Jordan and Iran are probably at the top of my list, as well as more of Turkey! I totally agree – it makes me really sad that I have to continue reminding people (including people I love!) that people in these countries are still people, and that they aren’t really any different then people in any other part of the world. Thank you so much for the article. I live in Malaysia, a country that put Islam as the main religion. Though Mr Trump did not list Malaysia, I am still being unsure if it is easy for me to come to US as tourist/traveler. The Malaysian government is trying very hard to get approval for the ‘Visa on Arrival’ thing for Malaysians, scrapping the idea of lining up for the interviews at the embassy. I have long dreaming of coming in as tourist/traveler but ever since Mr Trump started to say no to this and that, oh that gave me some ‘negative’ feelings about my plan in 2018. Thank you for the enlightenment that there are good things about Islam countries. It’s not about the religion actually, it’s about that group people who lost direction or right path in their life that makes a country looks bad. Trump need to understand that not all people from that 7 countries are bad. Most are great people. I hope he open his eyes and heart some day. As for the article of yours, love reading the list of beautiful things. Been to some that you listed, amazing countries and hope Trump read it too, Amen. Just posted my favorite low cost carrier being approved flying to US but not sure if it is that easy to get that Visitor’s visa now. Ironic. High possibility for cheap fare but high possibility of not being able to come in.. So much respect for this post. I have no immediate plans to travel overseas (unfortunately), but I appreciate your using your platform to shine a positive light on these beautiful countries and people. Thank you! I feel like it’s part of my job as a blogger! I tend to focus on the positives of places anyway, so I definitely thought it was important to write this post. What a beautiful post, and much needed right now. You don’t need to travel to become open minded, but it really does help. You’re right that it certainly does help! Thank you for including my submission in this inspiring and important article! Thanks so much for submitting, Lillie! I couldn’t have done this without my fellow intrepid travel bloggers! Absolutely loved this post. I have been to several Islamic countries, all with the most kind hearted people. It’s heart-breaking to see so many people vilify entire religions based on a few negative situations, it’s merely ignorance – Hopefully one day things will change, I have faith in humanity! Such a great post Amanda. Thank you for shedding light on the beauty of these countries that are really not talked about enough. There are a few on this list that I hope to visit one day for myself. In the meantime I really want to educate myself around these different cultures. I’m not going to be able to travel much outside the US this year, but I want to make it a point to visit some of these countries in the coming years in order to experience them myself and be able to tell people what they’re really like. What a beautiful post. I love all the photos, and a few of these countries are on my bucket list. And you’re so right that it’s impossible to separate travel and politics. Many of them are on my bucket list, too! I had fun putting this post together, since I haven’t been to most of these places myself and got so inspired reading all these stories! It’s true, though! Whether you’re from Canada or Cambodia, people want to be safe and happy and provide for their families. We’re not really all that different. And I agree that things are probably going to get worse here in the US before they get better – but I certainly hope they will get better! This was an awesome read! I love reading about peoples experiences in pretty much all of these places. I try and share this sort of thing with people if I mention interest in somewhere controversial. I really enjoyed collecting all these stories for this post! I love hearing positive things about the rest of the world, especially when there’s so much negativity everywhere these days. I love this post. Thank you so much for sharing! I’ve been to almost all the places listed up there (minus the Maldives, Pakistan, Iran and Oman), and I also only have good, wonderful memories from these places. The people I met were so hospitable and kind, and helped me in any way they could. To them, visitors are guests they want to take care of. I love travelling, and I never shy away from a place because of it’s religion, and I never will. I hope others will also realize that it’s not about the religion, it’s about the people – and 99 % of the people you meet out there are kind, honest, hospitable people like yourself. YES, exactly. It’s all about the people. Even if those people have different religious or cultural beliefs than you, it doesn’t mean that they are bad people (and this is true ANYWHERE in the world, not just the Middle East). Thanks very much, Sarah! I have my fellow bloggers to thank for submitting such great photos and stories! What a gorgeous post! Very happy to have been included! So happy to have been able to feature you and that gorgeous shot from Oman! It’s somewhere I definitely want to go now! Thanks for this post. I’ve been a little disappointed lately with how many people are proudly declaring they don’t want to talk politics, which sounds to me like a euphemism for burying their heads in the sand about current events. I really appreciate you addressing the situation in a way that’s authentic to your blog’s subject. Thank you for this wonderful post! I lived in the Bo-Kaap in Cape Town for a few weeks back in 2008 with a wonderful Muslim family. Travel and study aboard are more important than ever right now. SO important right now! I wish I was able to travel more outside of the US this year, because I would love to go visit some of these countries and write about them! The pictures and descriptions are beautiful, just for the sake of clarity – Ethiopia is not really in the Islamic world as Islam is not the dominant religion (Muslims constitute one third of the population). For this post, I welcomed submissions from any country where there was a large population of Muslim people. *Most* of them came from Muslim majority countries, but I didn’t want to turn any great submissions away because of percentage numbers. 🙂 Plus, I thought Norbert’s message of religious tolerance in Ethiopia was perfect for this post! Great post and fabulous destinations! The same works in reverse, too – I recently saw a post from a travel blogger wondering if she should continue to visit the USA as many of her friends were refusing. Most Americans you will encounter are friendly and welcoming. I’m sure there are horrible government policies in some of the countries you listed above as well, but that’s not why I travel and it often doesn’t represent the majority of the people. YES. I plan to travel a lot in the US this year, and am hoping to show people that there are still reasons to come here, even if you hate Trump like many of us do. Well just try to stay strong, Kayleigh! You now get to be an ambassador for America, to show people abroad that we don’t all support or agree with Trump! This is a meaningful and touching post, Amanda. These places are truly wonderful and beautiful. Thanks very much, Agness. I’m so glad this post has resonated with so many people! Thank you so much for sharing these beautiful, peaceful photos of the Islamic world. They all make me want to buy a plane ticket! But where first…another trip to Morocco, a first trip to Kyrgyzstan or Oman…so many wonderful choices. I know, so many trip ideas! Top of my list I think include Jordan, Iran, and Oman. Oh wow…this is an amazing post! I have been to Jordan, and I found the people there quite friendly. I believe most people, irrespective of their faith and culture, want love and respect. Morocco is on my bucket-list. Also, Turkey. I so agree about the love and respect – that’s not a cultural or religious thing; it’s just a human being thing. Jordan is very high on my own bucket list! Hi Amanda. It’s great to see my home, Indonesia, featured on the list. Ignorance is far easier to embrace than openness, because the latter requires us to be willing to understand other cultures, to get in touch with people who are different from us, and to broaden our perspectives and put everything in the right context. The problem about extremists, wherever in the world they are, is that these people always speak a lot louder than the majority. It’s very heartening to see intercultural and interfaith dialogues flourish, regardless of the hatred rhetoric some politicians resort to. It takes time to bring more people together into one big community that is the world, and no one ever says it’s an easy task. But we all know how rewarding it will be when we focus on our similarities than differences, and work together based on that. Thank you for the beautiful comment – everything you said is spot-on. What an incredibly beautiful post! It’s such a pleasure to open my Bloglovin’ travel feed and see some great content on the Islamic world. I lived in Kyrgyzstan for a year and Indonesia for two years, and I’m always super shocked that more people don’t go to these places, because they’re absolutely stunning, and the people are just the best! I think it’s just an area that people don’t know much about – and the unknown is often (unfairly) seen as scary. Hopefully posts like this will help change some minds! Beautiful Islamic world compilation and your explanation were wonderful I can see that you are really a great blogger. Thanks for sharing Amanda! Extremists exist in every religion and culture – it’s just unfortunately that the Western media likes to focus so much on the Muslim ones. Because you’re right – they don’t represent everyone! I’m glad to hear that your experiences there were positive, too! Very nice article 🙂 Islamic architecture is surely one the most beautiful and unique one. The exciting part of it is that it is as diverse as the different Islamic culture. I have been to Beijing once and I have seen the grand mosque of Beijing, and let me tell you, its architecture is something I have ever seen anywhere in the Islamic world! Iran has also one of the most beautiful architecture. Istanbul is also amazing! with all its Ottoman heritage! I really hope to go to Iran someday to see the amazing architecture there! Thank you for writing on the topic. You deserve respect. Waoo. Being a Muslim it’s nice to read such an article. I am from Pakistan (Skardu Baltistan The extreme North of Pakistan). Here are many Mosque which are more than 300Years old.